Steven Fletcher struck either side of the interval to hand Hibs a hard-fought victory over Dundee United. Fletcher netted with a diving header in the 22nd minute after he met a Colin Nish pass across goal. Dundee United defender Lee Wilkie fired in a low drive from distance to cancel out the opener as half-time beckoned. Fletcher doubled his tally and sealed the winner for Hibs with a left-footed strike in the 63rd minute, moments before Souleymane Bamba was dismissed. Hibs made an encouraging start to the game and could have opened the scoring in the third minute after Dean Shiels fed Colin Nish inside the box, but his pass to Fletcher fizzled out. Northern Ireland international Shiels engineered Hibs' next best chance in the seventh minute with a cross to Fletcher but the striker headed just wide from six yards out. 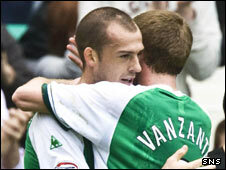 Just when United were beginning to look comfortable, Hibs took the lead through Fletcher after a great move. An Ian Murray cross was knocked back to the Scotland squad player with a cushioned volley from Nish and Fletcher's diving header beat Lukasz Zaluska from eight yards out. The visitors equalised in first-half injury-time after defender Wilkie's first shot from long range was blocked by Jones. The ball rebounded back out and the United captain fired in an unstoppable shot from 25 yards into the corner of the net. What did you think of the result at Easter Road? Fletcher put the home side back on top after the break with a left-footed strike from the right-hand side of the penalty area in the 63rd minute after some good work by Nish. Moments later, new signing Bamba, who featured recently for Ivory Coast at the Olympics, was shown a red card for his second-bookable offence following a rash challenge. Prince Buaben then missed the target in the 86th minute after the ball fell to him in the box from substitute Danny Swanson's corner. Moments later, Wilkie blew the last chance of the match from six yards out when he headed David Goodwillie's cross wide. Hibernian: Ma-Kalambay, van Zanten, Hogg, Jones, Stevenson, Shiels (Chisholm 71), Murray, Keenan (Riordan 61), Bamba, Fletcher, Nish (Rankin 71). Subs Not Used: McNeil, Thicot, Pinau, Campbell. Dundee Utd: Zaluska, Kovacevic, Wilkie, Dods, Grainger, Buaben (Swanson 73), Scott Robertson, Gomis, Conway, Sandaza (Goodwillie 83), O'Donovan (Daly 27). Subs Not Used: McGovern, Dillon, David Robertson, Kenneth. Hibernian manager Mixu Paatelainen: "We needed a victory today, and Dundee United are an excellent football team, they have good players all round and I thought our players battled very hard and passed the ball. "It was good to get Fletch a goal, it was only a matter of time. His work-rate has been unbelievable today. In the four previous matches he did really well, setting other players up and today he scored two fantastic goals. "Hopefully they're the first two of many." Dundee United manager Craig Levein: "We should have won, I was thrilled with the way we played today and I said that to the players after the game. "What more can you do? We had our foot to the floor right from the start of the game and we finished with some terrific performances. "Sometimes it just doesn't fall your way, and that was the case today. BBC Sport Player Rater man of the match: Dundee United's David Goodwillie 10.00 points (on 90 minutes).